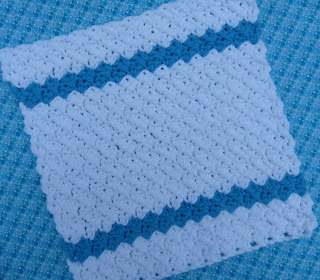 Simple Stripes Dishcloth has a nice texture, making it great for washing dishes. It's also a great way to use up your leftover scraps. Finished size is about 8 3/4" x 8 3/4". Thank you, thank you, thank you! Lovely pattern. A very nice pattern thanks for sharing it with us. 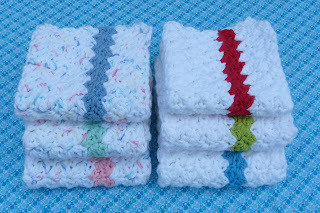 Do you use regular kitchen cotton for these? Love the color combinations. Thanks for sharing the pattern. Take care. Thank you very much, love these. thanks, i'm gonna work on one tonite..
they are so cute!! you could make a towel to match, too! I can't wait to try the pattern! thanks! I like this pattern, it's easier than it looks at first. 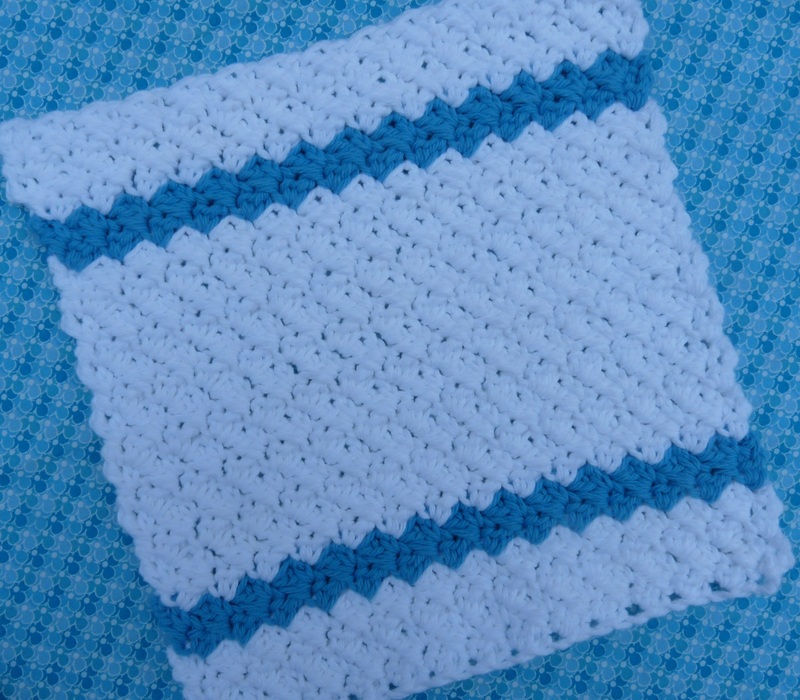 I'm using acrylic as that is all I have, but I've been told by another dishcloth pattern maker that acrylic is just fine and that it dries faster than cotton, so that's great for me. 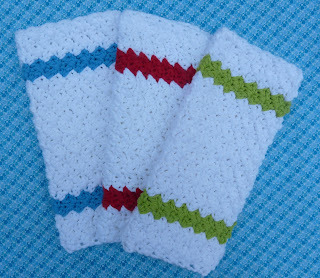 I don't know WHY I'm making dishcloths as I normally use cellulose sponges, but it was so cute I had to try one. 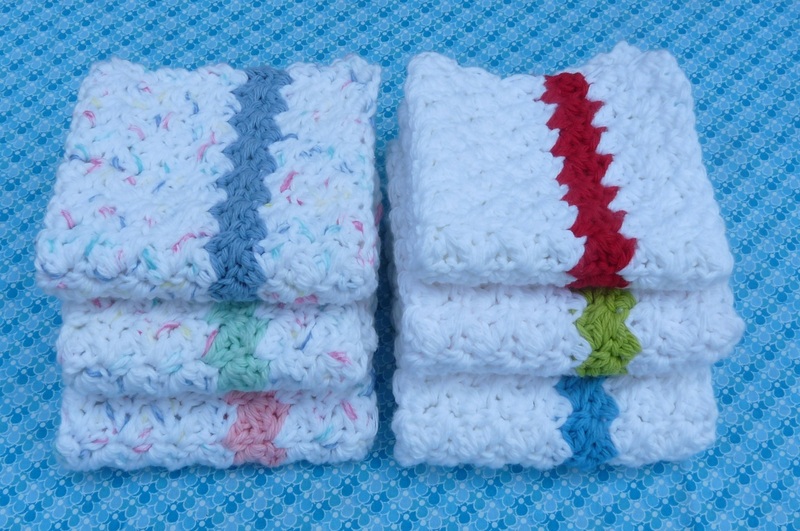 I plan to make one with a different color stripe for each day of the week, or if I get tired one, for each week of the month.LOL Oh, I could coordinate the colors with the Flylady zones each Week! that would be a fun reminder!! Thank you for sharing this pattern! I'm going to be "grounded" due to surgeries soon......will be fun & useful way to spend my time!